Varietals: Rhone. Reds: Mourvèdre, Syrah, Grenache, and Counoise. Whites: Roussanne, Marsanne, Grenache Blanc, Viognier, and Picpoul. The complexity and depth of Tablas Creek wines is readily apparent. However, it is very hard to get a good read from just one tasting. 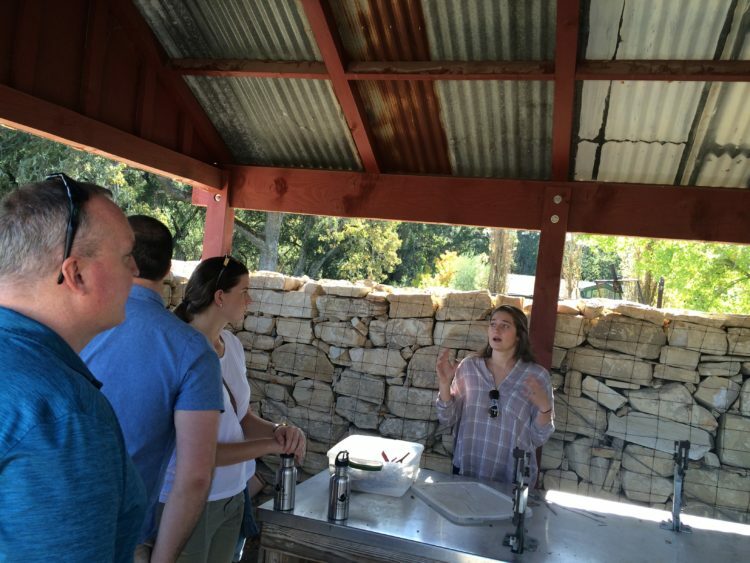 Originally, we had our first tasting with Laurel during our tour for the Winery Spotlight story (see link above), and took many notes on the wines on the tasting list. 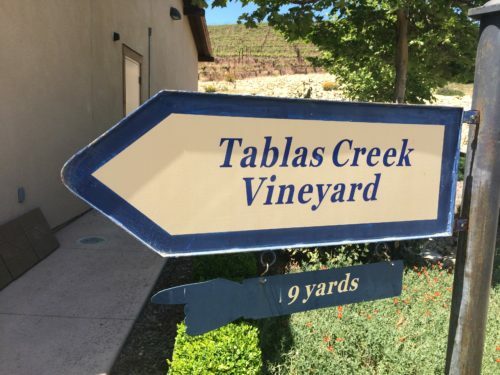 As we recapped our notes, we agreed that to provide the best tasting notes feature, we needed to revisit Tablas Creek Vineyard for a second tasting. We made it up to Tablas Creek again on a beautiful day at the end of December, and enjoyed a tasting with our host Haydee. Driving up, I was thinking of all the interesting flavors and complexities that we experienced the first time and it filled me with curiosity and enjoyment of what wine tasting can be: learning, experiencing, and enjoyment of an art. Here are some of our notes from both tastings of the wines that stood out from the Flavor Team perspectives, noted by our initials (ab) and (ks). Both tastings included a core list of six wines — two whites and four reds — starting with Grenache Blanc 2015 and finishing with Espirit de Tablas 2014, plus a few off the list. Espirit de Tablas (red based on Mourvedre; white based on Roussanne) are the winery’s flagship Rhone-style blends. Rich, balanced, and will age well. Cotes de Tablas (red based on Grenache; white based on Viognier) are blended to be fruity and appealing, ready to drink at a young age. Patelin de Tablas (in red, white, and rose) use fruit from the top Paso Robles Rhone-style vineyards and offer classic flavor at exceptional value. (ab) I love their description of this wine, “Our varietal bottling of the southern Rhone’s most ageworthy white grape.” As you will get to know me I tend to like red wine the most. I think that makes me more appreciative of a nice glass of white wine among the tastings that call to me. Here the light 2014 Roussanne wine had a nice aroma of fruit and light acid tones. The taste was light and well balanced with a hint of oak and honey. I heard they use a lot of their Roussanne varietals in their Esprit de Tablas Blanc, and glad there is a little left for this single-varietal offering. Fun to taste this next to the esprit blanc to see if you can sort out the different tastes. This offering is for the wine club only (and tastings!). Since that first tasting, I’ve come to appreciate more and more the Tablas Creek wines. They are not typically the big, bold jammy wines (which I also love, by the way), but more refined, layered, and subtle. I’m learning that beneath those reserved facades are some deep traits and qualities. I, too, am more of a red wine devotee, but this 2014 Roussanne is captivating. Its light lemon hue suggests the honey and floral aromas, and a nice balance of acidity and minerality make this a very good white. The more I taste it, the more depth I sense. I realize this must relate to its ageability — the layers are just waiting to deepen. While it is ageable, it is also enjoyable right now. (ab) One of the other wine tasting offerings I really enjoy when we get the opportunity is to try different years of the same wines side by side. 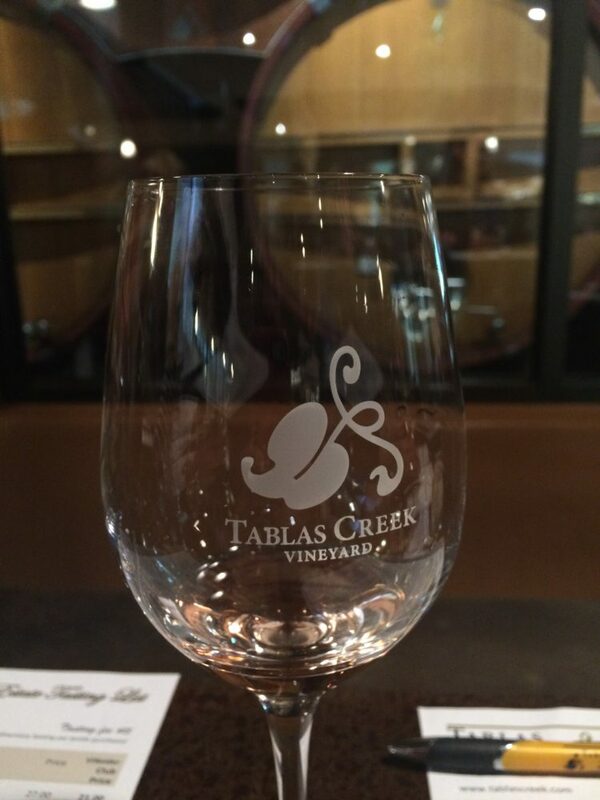 Tablas Creek pours the 2012 & 2014 Esprit De Tablas red blend as part of their tastings. This is their flagship red and is a nice blend of Mourvedre, Grenache Noir, Syrah, and Counoise. The 2014; This year had a very nice dark purple tint with a swirl and a deep intake of the aromas you can smell the deep berry and smokey campfire. Mmm. The taste was a wonderful balance of what I am slowly recognizing as the deep cherry cola and slight mineral tones. This one was during a drought year and with the vertical tasting of the two years the (2012) year was slightly more herbal/earthy while the (2014) had a little more minerality with a great taste of the berries and smokey aroma. Both were good, but the balance of the aroma, flavor, and overall punch I like the 2014 Esprit De Tablas. Have you tried them both? What were your takeaways? (ks) I enjoyed the chance to taste the 2012 and 2014 side by side and compare the effects of Mother Nature on a wine’s expression. The wet year of 2012 led to a wine with more vegetal and maybe even minty undertones, while the drought year of 2014 resulted in a bolder wine but softer tannins and a bit of butter. The 2014 is my first choice as well, and one I have stashed in my (very small) Tablas Creek collection to age a couple years. It’s going to be fun to uncork this later and see what’s developed. (ks) I’m including this wine as a favorite for two reasons: one is that Mourvedre is often used as a blending varietel, so it’s a treat to taste it alone. In fact, Tablas Creek notes it as its “most important red grape, which forms the backbone of our Espirit de Beaucastel blend.” The second reason is the taste. With a deep blueberry juice color, the aromas I pick up are dark berries and black cherry and the richness of freshly plowed soil. It has some minerality both in aroma and taste, but not overpowering on either side. Like the Roussanne 2014, this wine ages very well and it will be fun to try it again in a few years. 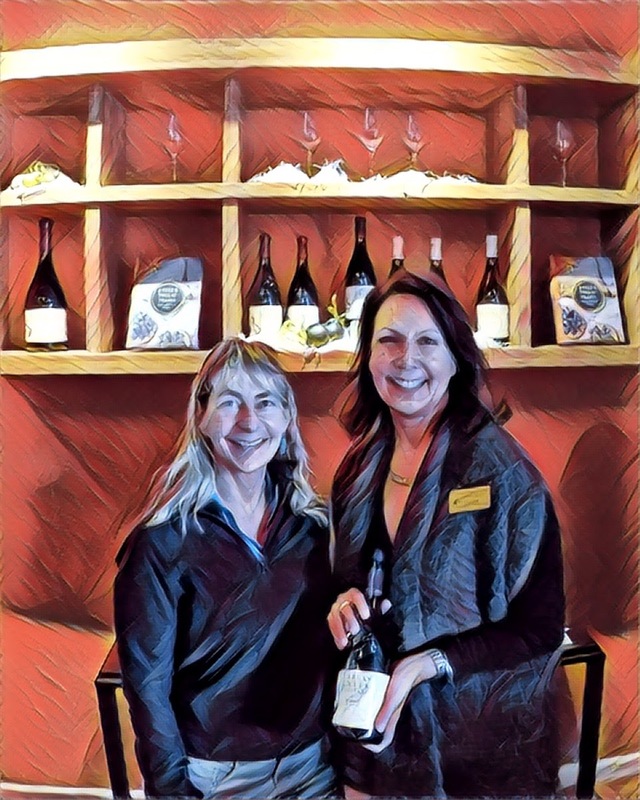 (ks) When we visited Tablas Creek the first time, Laurel poured this and shared that it’s a Syrah that people who don’t normally like Syrah will enjoy. I personally like the big bold Syrahs that we typically equate with that grape, so I’m eager to try this one after Laurel’s description. Indeed, it’s bright, light, and balanced. I pick up strawberry aromas and berry tastes, with medium tannins and none of the heaviness that some Syrahs exhibit. Laurel also mentioned that the winemaker described the wine’s “powdered-sugar tannins,” which well describe the soft yet apparent tannins. If you like Syrah, try this wine for a different approach. If you don’t like Syrah, try this wine and see how good Syrah can be. Let’s head to Tablas Creek together. 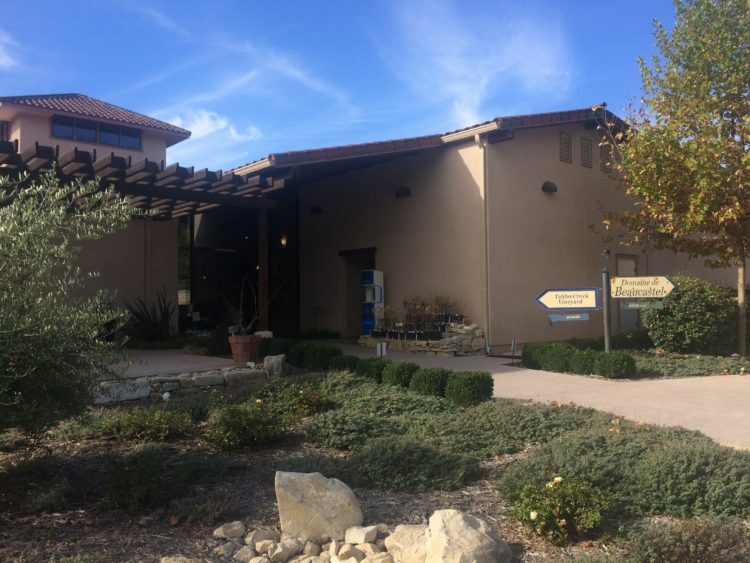 (ab) Every time I get the chance to come to Tablas Creek I have new experiences with the same wines. I hope it is because I am growing and evolving (optimistic) as a wine drinker. However, the deep complexities and many different choices at Tablas Creek make this winery a tour de force. If you have not already discovered it year, make plans to come see the beautiful ground, great tasting room & hosts, and above all the wines. See you there. Varietals: Tablas Creek imported from Chateau de Beaucastel nine primary Rhone varietals. Reds: Mourvèdre, Syrah, Grenache, and Counoise. Whites: Roussanne, Marsanne, Grenache Blanc, Viognier, and Picpoul. Ecology: Dry farmed and organic (certified in 2003). Biodynamic practices implemented in 2010 with goal of certification. Awarded 2016 Green Medal from the California Sustainable Winegrowing Alliance.